You own a business and know that social media is the hottest, newest way to tackle marketing for your company. However, you have no clue how to get started. That’s why the Social Media Activity Book for Small Business Owners was created. This 20-page Activity Book provides you with information about the type of social media you should be using and why to reach current customers, to generate new leads, and to increase brand awareness for your company and its services and products. Insights into posting schedules, and how to manage the social media marketing efforts your company needs. What are you waiting for? 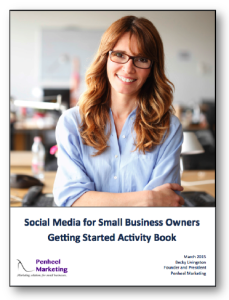 Download the free Social Media Activity Book for Small Business Owners today!